April is Earth Month worldwide. The month we love and honor Mother Earth. Here in Kenya April starts with the birth of Wangari Maathai April 1, 1940. Wangari is a hero to many in Kenya and a huge inspiration to Wana Duma. 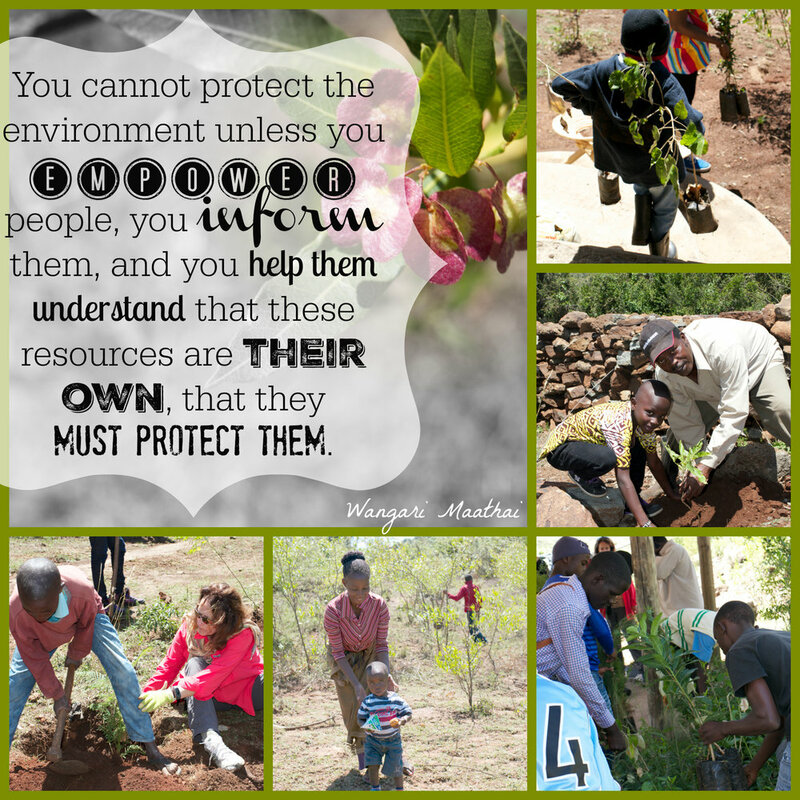 She founded the Green Belt Movement (www.greenbeltmovement.org) to save the forests of Kenya and bring awareness to disappearing resources. Wangari is also the first African woman to be awarded the Nobel Peace Prize. Her efforts created over 6,000 womens groups managing nurseries, planting and tending to trees in addition to over 1000 green belts run by schools and their students. In the end, over 30 million trees have been planted by this movement. How can you not be inspired!?!?! When we acquired the 7-acres, now called Wana Duma Eco-Village, it was heavily overgrazed and deforested, the land etched with severe erosion. Too many animals and not enough land lead to overgrazing. With no trees or bushes to hold the fertile soil to the land, it washes away during the rainy season. This then creates the unprecedented flooding of today. We've worked hard with our caretakers, students and visitors to bring back the land. The first step was to damn up the eroded funnels and plant banana trees. Next we started our "Wangari Maathai Forest” planting her favorite endangered trees. She fought so hard during her lifetime to save these species for her country and continent, we are proud to plant them in her honor. Our parcel of land is unique in that we look over at another hillside where they still illegally cut trees to make charcoal. I can visually show our kids that "they" (across the river) are destroying your future and "you" (the student) are protecting yours. A shock to the senses, the sight of rapid deforestation on the next hill and smell of burning wood throughout the valley brings the point home. The contrast is vivid, the lesson real and not read abstractly from a book or newspaper story. In the last 5 years we've planted well over 1200 trees on our hilly parcel. The most fertile land being turned over for maize, cabbage, beans, bananas, potatoes and other fruit trees to feed our families. Our land is living, growing, producing, providing jobs and preserving resources for the next generation. We have a new student brought to us late last year who I hadn't had the opportunity to meet. I happened to run across him on one of my trips to Eco. I asked where he was headed, his reply "to make charcoal". He was passing right by Eco to make money to feed himself. He is a total orphan being assisted by the Headmaster of his school, who called us for help. I introduced myself and proceeded to offer him a job at Eco to dig holes, plant trees and care for them instead of destroying them. He's been working out very well for us the last 2 months. He's happy and fed and keeping his grades high enough to get a scholarship for college. As with most things, it all comes down to money. The underprivileged can't afford paraffin or electric (if they even are hooked up to electricity! ), their only options are firewood (very scarce) and charcoal. The other users of charcoal are the restaurants that serve roast meat (Nyama Choma), to get the flavor they want. Now, we have added a new dilemma to this saga. The Government has banned cutting down trees (although private landowners still can). Charcoal is worth a lot more and too tempting not to pursue. It is what you know, what you do to feed your family and now you can double, even triple your income. How can you possibly stop! Habits are hard to change until you are forced to - being arrested or heavily fined is definitely a deterrent! Thank goodness there are NGO's out here working on this very issue, introducing solar cookers and cookers that use very little wood. For now Wana Duma keeps planting trees, educating our kids, Moms, and Cu-cu's (grandmothers) and changing what we can in our small project, one family at a time. Like the hummingbird in Wangari Maathai’s story – we do the best we can. A little bit goes a very long way in Kenya. If you would like to help us continue and grow our project, consider making a tax-deductible donation.